At IBM Watson Marketing, we believe deeply in this practice and have dedicated a large effort to provide some of this critical data to marketers. The newest IBM Watson Marketing annual report of marketing benchmarks is bigger and better than ever with mobile marketing metrics data in addition to email marketing metrics. 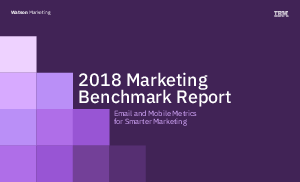 This year’s report includes traditional benchmark metrics such as email marketing open, click-through and unsubscribe rates, as well as email client and device data and engagement/read rates. New this year to the report are delivery and message frequency metrics for SMS and open and clickthrough rates for mobile push messages.